Buenos Aires, December 2012. A hot Christmas is only a few days away. Last purchases are made. Shimmering heat is all over the city and above the always bustling traffic. The Federal Parliament makes its final decisions before the holidays. The Police outside is dozing in indifference. All of a sudden hundreds of indigenous people flow through the urban canyons towards the city center. The old, the young, the women, and the men first squad the main road in front of Parliament, then they take over all side streets, block all the traffic. Urban groups join them. Together they transform the streets into colorful dancing courses and they send their negotiators in the Congreso. The home of the Indigenous is almost a thousand miles away. It is another Argentina, a forgotten one. It is an Argentina without skyscrapers, TV and hospitals. It is the Argentina of the dusty scrubland of the north. But home is always home, is it? The home of the indigenous people is under threat. Because GM seeds, Herbicides and chemical fertilizers have now made the soybean cultivation profitable even in the barren northern regions and they have turned the country into an object of speculation by Monsanto & Co.
Just as in the beginning of the colonial history of the country, once again the indigenous are supposed to recede. But this time everything is different. They do not recede. They resist. It is a struggle of now twenty years in within not only the land grabbers are defeated but moreover the indigenous people have begun to replace state power in their territories by egalitarian structures new to the globe. They build wells, solar systems, their own schools and now even a university that reinvents the teaching and the learning. In the fight against the multinational agribusinesses the Campesin@s globalize hope for all of us. “No Rest. No Haste.” (Documentary, ARG /Germany, 60 min, English subtitles, 16:9.) is a participatory project of Kameradists. The interviews were based on numerous messages from people from the Federal Republic to the indigenous people. They arose as reactions to our thematically related and first film “Sachamanta“. | “No Rest. No Haste.” would not exist without the financial, logistical and moral support for the project “Espejo“of more than one hundred people, foundations and small businesses, which are recognized in the credits of the film. From the project “Espejo” also sprang the short film “Tincunacuy”, showing the return of the film “Sachamanta” to the people, that it portraits. “Tincunacuy” can be watched online under this link. 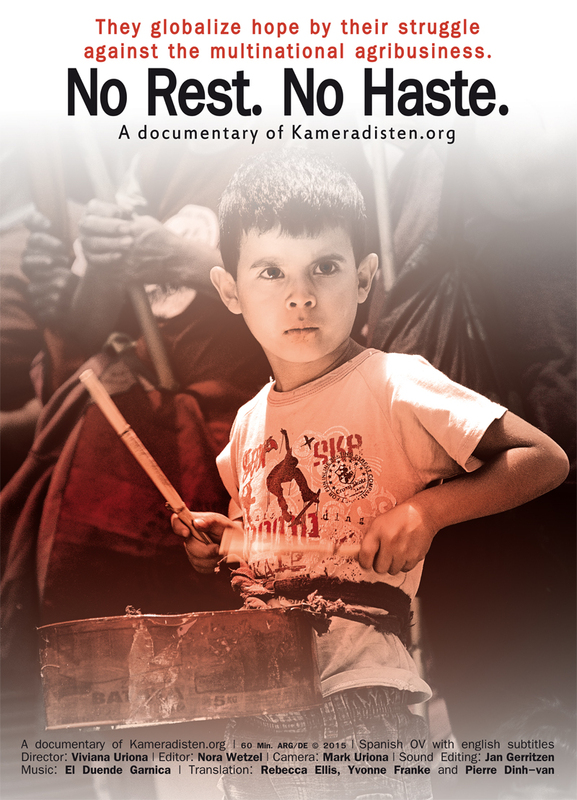 The Kameradists are a free association for documentary filmmaking and documentary photography with a critical awareness of politics and society.